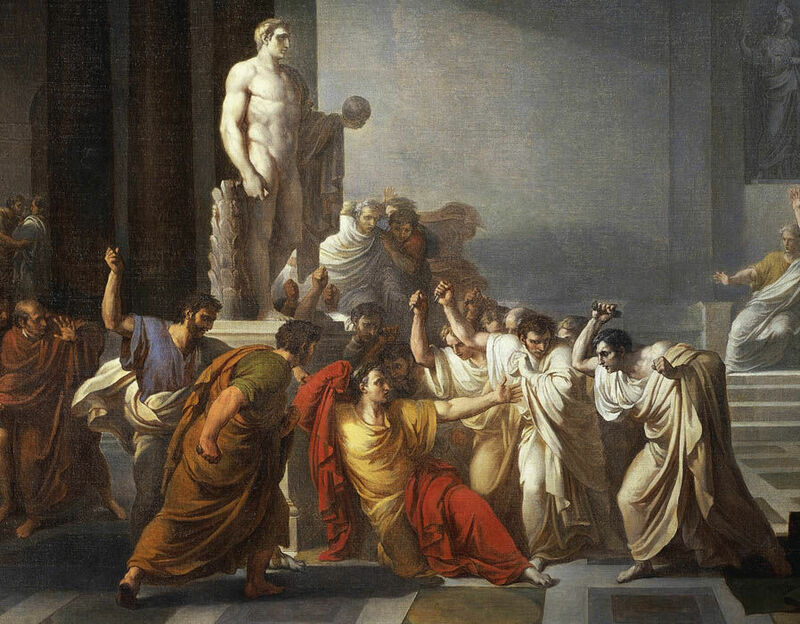 March 15th, 44 BCE: Roman politician Gaius Julius Caesar is fatally stabbed 23 times by a conspiracy within the Roman Senate who fear his increasing power. March 15th, 2017 CE (2062 years later): A descendant of ancient and modern Romans* starts a blog about the food of his ancestors, beginning with a substitute waterfowl. Yes, I started this blog on the Ides of March, anniversary of Caesar’s assassination. I was born on the anniversary of Cicero’s assassination (December 7th, which is also Pearl Harbor Day), so it all works out. In honor of this momentous occasion, here’s my first post, in which I passed myself the titular flamingo, which was actually a duck, because, well, life isn’t perfect. Thanks so much to everyone who has visited and followed Pass the Flamingo over this past year! Whether you’ve read one of my posts or all of them, I appreciate your support so much. Here’s to another year of ancient food history! Expect more recipes, more experiments, and more flash fiction. In fact, here’s some of that last one. The queen took a bite of roast flamingo and winced. Sweet dates, bitter rue, pungent silphion against the strong flavor of the meat itself. Overpowering, an assault on the nostrils. She had never been fond of Roman-style cooking. Not on her first trip here, when she was a child following her exiled father, and not now. Yet they insisted on serving it to her. Nobody in Italy could recreate the flavors of Egypt, even if it was one of Egypt’s great rosy birds that now lay before her, flayed and sauced and spiced. She should have brought her own chefs from Alexandria, but Gaius had wanted to take care of everything. He loved to do things for her. Maybe he saw in her his long-lost daughter, even though she was a queen and a living god. Even though her son by Gaius was already learning to crawl. She was well-cared for, in truth. She and her servants had the run of the whole villa. She was invited to every banquet and function, she had gotten to meet all the most important people of Rome, senators, consuls and generals and their wives, even if most of them couldn’t stand her. Gaius had placed a statue of her in his family temple, beside the shrine to Venus. His wife had not been in attendance that day to see it, and the queen was glad of it. She knew what was whispered about her in the streets of this foreign city. She saw the way the Romans looked at her and her son, how vicious Fulvia and that ponce Cicero tittered to each other behind their fans, switching suddenly from Greek to Latin so that she couldn’t understand. Sometimes she felt like a flamingo herself: a proud and beautiful plumed thing, served up for the people of Rome to feast on. From the corridor outside came the sound of running feet. She looked towards her doorway, puzzled. * My father was born in Rome, and my known family history is 100% Italian (with some of the Balkans mixed in way back, according to my DNA results from 23andme). I like to think I’m descended from Cicero and Apicius and Elagabalus, although more likely my ancestors were illiterate Alpine villagers. And before that, illiterate Alpine villagers.